Batavia, New York - Genesee Community College is pleased to host the Virtual Business Trade Fair on Friday, March 29, 2019. The trade fair will be set up in GCC’s William H. Stuart Forum at the Batavia Campus from 10 to 11:30 a.m. for everyone to come and enjoy some virtual shopping. 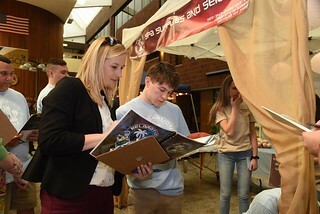 The Virtual Business Trade Fair, available through GCC’s Accelerated College Enrollment (ACE) Program, provides students enrolled in economics and entrepreneurship courses with a hands-on learning opportunity to apply the theories, practices and knowledge from the classroom to an almost-real innovative business venture. The students work collaboratively to develop all of the components of a successful virtual business. They begin by writing mission statements and conducting extensive research into product features and competition, and culminate their work, with advertising pieces, trade fair displays and salesmanship. The students’ trade fair goal is to sell their products or services and allow the attendees to make purchases with virtual dollars. Community members are invited to come, pick up virtual spending dollars, shop any of the companies and support our local students. Thousands of virtual dollars will be given out to attendees to “spend.” At the end of the trade fair, the business or school with the most virtual dollars and virtual sales will be recognized. For the fourth year, volunteer bankers from M&T Bank will be on-site to help the virtual businesses to track and manage their sales, while local business representatives and instructors will be judging the businesses on their display booth, marketing strategies and salesmanship.